45 Pop Lofts is the first building in our Garden City Project: a pair of multifamily buildings located right behind Garden City, a historic 1950's outdoor shopping mall. But 60 years after inception, Garden City is becoming a small city center in it’s own right. This project presented us with an opportunity to contribute to a growing walk-able community where we can help increase density without sacrificing amenities and open space. Expanding to "suburban infill" was something we couldn't resist and the neighborhood is in full support. In keeping with our interest in re-purposing existing buildings, 45 Pop Lofts began life in the 1960s as the Catholic-Johnston Regional Catholic school. When we purchased the building and property the school had been decommissioned and the building abandoned for nearly ten years. 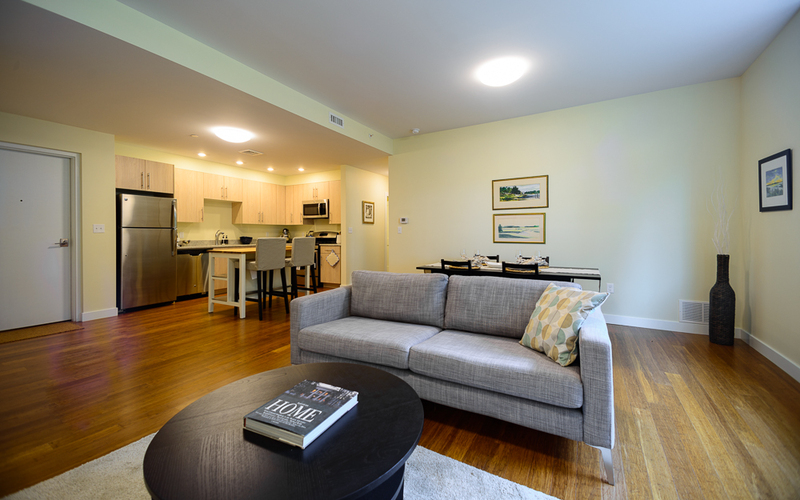 Our work included a full gut renovation and the reconfiguration of former classrooms into one and two bedroom apartments. The result is a 20-unit building with modern features and amenities that meets energy star standards. The building has been fully leased since the day it opened.